Keiko Brodeur; the woman behind “Small Adventure”, began making illustrated paper goods in 2009. 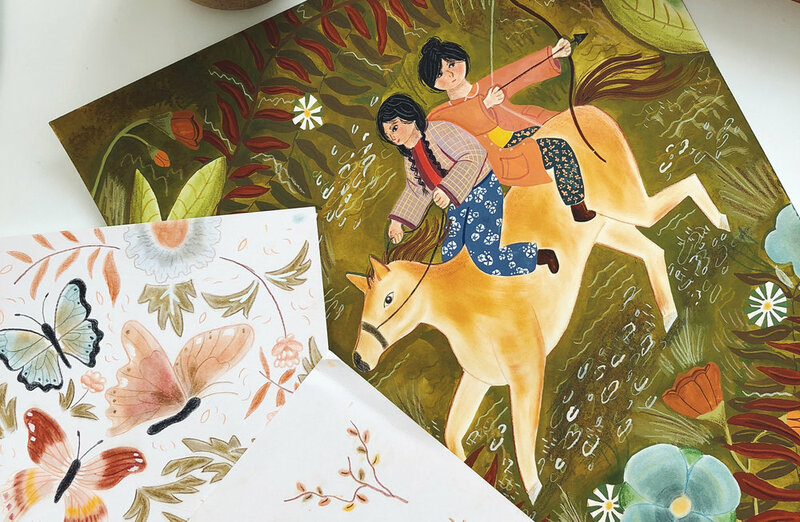 After graduating in graphic design and going into work, she soon fell in love with creating illustrations for greeting cards and other products. For our December Papergang artist we thought Keiko’s outdoorsy illustrations were the perfect fit for the time of year! Learn more about Small Adventure below, and sign up to Keiko’s Papergang box to get your hands on some superb stationery this December! Thanks for chatting with us! Let’s dive right in…What led you to create a brand surrounding nature and the outdoors? With beautiful cards featuring landscapes and adventurous stories, your name of ‘Small Adventure’ sums up your illustrations perfectly. Since I was a kid I've always been drawn to spending time outside and imagining myself traveling and adventuring. I lost a lot of that love as a teenager and at the beginning stages of becoming an adult, but as I started noticing friends my age getting back in touch with nature and camping more often I began to rekindle those nostalgic magical feelings I had as a child. The aesthetic of nature and the tools and gear that are necessary to survive in the wilderness were also so intriguing to me and that's when I painted one of my very first illustrations for my business card that later became part of a series of cards called What to Pack cards that I created my brand around. With prominent hand-made textures in your work, what is your favourite medium to work with and how did you discover your love for it? I started Small Adventure after college and during one of my subsequent jobs by making all kinds of little objects: felt envelopes that looked like old-fashioned mailers, archery-inspired wooden jewellery and little leather pouches. But I've always had the fondest love for paper and I started making little card packs of bird and animal illustrations, housed in muslin pouches. I remember the feeling I had while drawing and it just couldn't be compared to anything else. I can't say that I was great at drawing then or that I'm that good at it now (even though I've definitely gotten better) but I knew then that I wanted to illustrate with paint and paper. And this year I've discovered a love for other mediums such as Pan Pastel, colored pencil and other inks, paints and dry mediums as well. Speaking of discovering your current medium and style; could you tell us about your creative beginnings and how Small Adventure has got to where it has today? I think I've always been somewhat of a creative person and I recall going above and beyond with the creative aspect of school and personal projects, but it wasn't until college where I found "my people" who had similar taste as me and were creating and experimenting in a way that opened my eyes to all kinds of art which is when I started experimenting a bit with drawing. After starting Small Adventure and creating enough products that I thought I might be able to showcase them to customers, I started an Etsy shop and then decided to share a booth with Erin Dollar of Cotton and Flax at a Renegade Craft Fair. It seemed like a pretty successful first attempt so I kept doing craft fairs and through those found a local sales rep for stationery, I then started selling my products wholesale with local stores. My sales rep really only represented stationery items so making greeting cards kind of became my bread and butter organically and I realized that translating my illustrations onto paper products was the most exciting product for me to make. My business has naturally grown over time with more and more shops gradually getting in touch to stock my cards on their shelves. I'm so grateful for all the stockists we have and there's no way I could be where I am today without their support. I also hired a couple wonderful friends in the past few years to help out at my studio to handle packaging and shipping all the products out and I am just as grateful for their expert help. That’s such a lovely progression Keiko. We noticed that Small Adventure prides itself on being a minimal impact company; with plant based “plastic” sleeves and re-using materials, you’re setting the bar for a more sustainable future. How important is the topic of being ethical and sustainable to you? And do you have any advice to those who want to reduce their plastic waste? Right at the beginning of making greeting cards I couldn't stand the thought of all this plastic being used once and then going into landfills all over the world so I researched the internet for possible paper options, but then eventually discovered a company called Clear Bags that manufactures a plant-based "plastic" that you can toss in your compost bin and they biodegrade! If I hadn't found this particular product I'm not sure I would've gone ahead with making greeting cards as using the least amount of plastic possible is pretty important to me. At the studio we also save and re-use as many of the packing materials and boxes that come in with our supply orders. We also use 100% recycled envelopes that were manufactured using hydro-electric power. And I just found a local composting place so I'm about to buy a bamboo bin for us to keep our food scraps in. One of my studio assistants is also about to launch a zero-waste online store, full of beautiful and high quality products that can take the place of disposable products that we use on a day-to-day basis. Her instagram is @matchboxkitchen and I've learned so many great tips from her like bringing your own take out containers when you eat at a restaurant for leftovers, buying clothing made from natural fabrics and using your own cotton produce bags when you shop at your local farmer's market or even at the grocery store instead of using their provided plastic ones. Her approach is great in that we all have super busy lives and the best way to create less waste is to just do what you can. Actual zero-waste isn't really a possibility so doing small things like bringing in your own cup to get coffee or carrying a small pouch with your own stainless steel straw and utensils can save on so much waste and isn't very inconvenient once you get in the habit of it. I feel so much better about my carbon footprint just from doing these small things and seeing how little waste I'm using compared to before. Outside of the studio what keeps you motivated and ready to create the next design? Do you enjoy a nice walk in the park or snuggling up watching a new film? What keeps me most motivated is deadlines unfortunately! Being a part of the stationery industry means working in a constant cycle of creating artwork for cards, manufacturing them, designing catalogs, sending out marketing materials, shipping out wholesale orders, repeat all year long. But things that keep me inspired to make new artwork is definitely being out in nature, seeing something that sparks an idea in a movie/magazine/photographs and looking through beautifully illustrated childrens books. A show (that is also a series of books) that have been inspiring me lately is a new television program produced by Netflix called Hilda and it has been making me feel so fuzzy and warm and ready to get out there and have some adventures. And finally, what would be your perfect ‘Small Adventure’? I'm actually about to go on a trip that my husband and I have been thinking of going on for many years and we're finally going to do it for our 10-year anniversary. We're going to road trip around the New England area during the autumn season and go on hikes and visit farms and explore as many towns as we can while drinking hot drinks and drawing in our sketchbooks. As we're both from Southern California and never get to experience a real fall I think this is going to be one of the most ideal small adventures for us. I can't wait! Have a wonderful adventure Keiko! Follow Small Adventure on Instagram @smalladventure and check out her card range with Ohh Deer here. Want some cute wanderlust stationery featuring artwork by Keiko? Subscribe to December’s Papergang Box! For £10.95 you will receive a box full of stationery goodness delivered straight to your door. Click here or the big button below to head over to papergang.com. Great as a Christmas gift or a cheeky something for yourself!